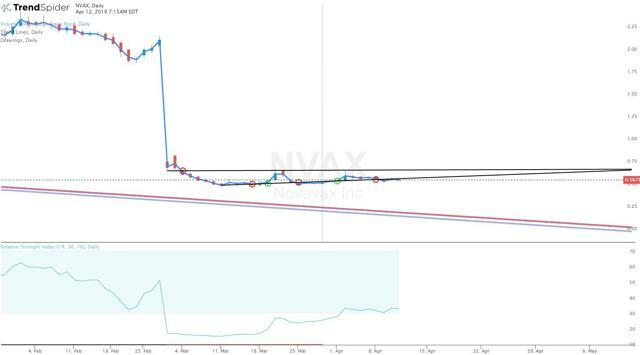 There has been a debate about the prospects Novavax and should investors have "Hope" in the company. Both sides have their points and appear to be equally weighted. This battle is now being fought in the market as the stock is in a stalemate around $0.50-0.60 a share. However, the charts are starting to show an upward trend. The share price fallout was due to disappointing Prepare study data. In opposition, the data did show ResVax was able to thwart the more severe cases of RSV in infants. I lay out my reasons for entering NVAX and how the charts are showing hope before the company can. In addition, I present some of the major downside risks moving forward. Novavax (NVAX) has been an enigma for me and has kept me on the sidelines. The fundamentals of the company and technicals of the stock chart never lined up for me to buy in. I always found the market cap to be overpriced and the share price seemed to be caged-in the $1.00-$2.50 range. Despite the upside potential of the pipeline, I always passed by in favor of companies with a bit more movement to them. Following the RSV vaccine readout, the share price imploded and then remnants scattered along a $0.50 floor. These events have prompted antagonistic articles from Stone Fox Capital and Out of Ignorance about whether there is hope or no hope for NVAX. After reading both of their articles, I realized that NVAX has been a battleground over hope for many years. Inside there are bulls pointing to the potential of the pipeline and bears pointing the failures. At some point, one was going to have to give. All those times I decided to pass on NVAX due to perceived stagnation, I was actually passing on a stalemate that was waiting for a catalyst to determine the winner. At the moment, the bears have won the day but have limited space to pursue much further. The bulls were not completely routed and potential reinforcements appear to be gathering for a counter. Despite the crushing defeat, there is still hope for the pipeline and the stock looks to have found a double bottom over the past month and could breakout above $0.65. Indeed, that might not sound amazing for investors who have been holding NVAX in the $2.00+ area, but it establishes hope for recovery; which can generate optimism that the broader market believes ResVax and the rest of the company’s pipeline is worth it at these prices. Sometimes all the analysis of the fundamentals needs to be discounted and the psychology of investing needs to be the barometer. The stock market breakdown is mostly fundamentals and technicals, however, some of the bigger moves are being generated by emotions. The magnitude of the NVAX sell-off and flatlining was capitulation and now the bottom-feeder buying is generating a bit of hope. The $0.50 bottom was not a previous technical low, nor does it have a fundamental valuation to match with. Therefore, I see this bottom to be created around the idea of the clean number of $0.50, which tells me the market doesn’t have a true value for the disappointing data. Why did the stock lose 70%? Was it fear or surrender? The emotions of disappointment generated the massive sell-off. The $0.50 area is was a subjective choice for a support level. Besides the company’s proposed reverse stock split “r/s” and potential dilution, the company has more potential positive news to be reported than negative. I see this new arbitrary support and the potential for a positive news event is enough for a speculative buy. I will review the ResVax Prepare study results and how it proves there is hope left for the RSV vaccine. In addition, I intend to present how hope will come from the share price before the company can deliver confidence. Furthermore, I propose some potential downside risks that need to be considered by investors and show why this is a high risk/reward stock. Novavax is a biotech company that concentrates on the development of vaccines to thwart dangerous infectious diseases. The company's lead pipeline candidates consist of ResVax, a respiratory syncytial virus “RSV” vaccine and a seasonal influenza vaccine branded NanoFlu. ResVax is an adjuvanted fusion “F” protein recombinant vaccine to defend newborns from RSV disease via maternal immunization. NanoFlu, which is at Phase II for treating seasonal influenza in adults. The company relies on its Matrix-M adjuvant; which is designed to enhance the amplitude of the immune response to the vaccine permits a significantly lower dosage of the antigens. The company has also attempted to develop RSV vaccines for adults and another for healthy children between 2-6 years of age. Additionally, the company has tried to develop a nanoparticle vaccine candidates for Ebola virus and a combination “respiratory vaccine” to defend against both influenza and RSV. 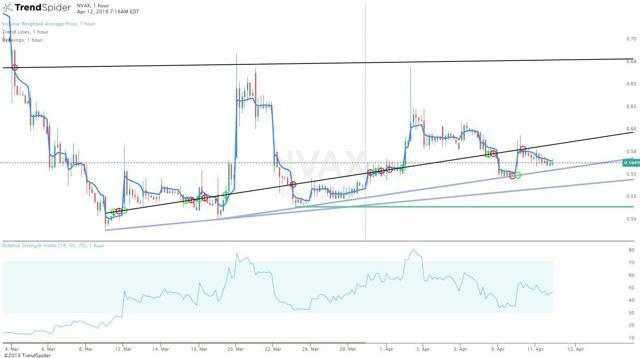 Back on February 28th, Novavax reported their results from a Phase III ResVax “Prepare” trial for maternal immunization against RSV disease. The data showed that the treatment group failed to satisfactorily detach from placebo in LRTI through 90 days of life. This news decimated the share price and investor sentiment. Many investors saw this RSV data to be critical to their investment and the bad news embedded the perception that there is No Hope left. The statement above did not seem like a white flag. In fact, Novavax did say they were going to provide additional data at an upcoming conference. Although we do not know that this additional data will change the ultimate judgment on the trial but it could provide Hope that the vaccine could have a path forward in the regulatory process. The company announced it will share phase III data at the World Vaccine Congress in April, but I cannot find any confirmation it will contain “additional” data. The presentation is scheduled for April 16th, so investors should keep on the share price in the days prior and after the presentation. The vaccine still has some ammunition left for its use in RSV. 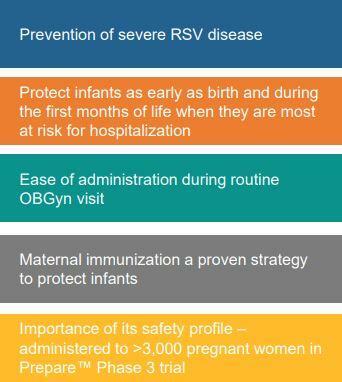 Most notably is the fact the ResVax is safe, which obviously a major concern in maternal vaccination. The company reported that the study did have some significant discoveries such as, the vaccines ability to prevent severe hypoxemia and hospitalization. Yes, the study did not hit its primary endpoint but the vaccine appears to help thwart severe cases/symptoms of RSV. In addition, these findings were consistent in all countries in the study. So, perhaps there is a case for the ResVax going forward but it looks as if it will be up to the FDA and European Commission on the details. The world still needs an option for RSV and perhaps they see the benefits of ResVax outweighing the risk of not vaccinating. It might not stop every infection but it could help the statistics in figure 3. The best outcome would be if the FDA and the EC decide the company is allowed to file for approval as is, but I find that unlikely due to the failure to hit the primary endpoint. However, ResVax has demonstrated meaningful efficacy in the most severe cases of RSV and could have the company move forward with the filing under the condition that Novavax completes a post-approval study. This would be a major win for shareholders and should trigger a momentous surge in the share price. The primary downside risk comes from the FDA and EC about what they decide is the best route for ResVax. Although I believe the current share price has priced in the worst case scenario, I still see some investor fallout if one of the agencies requires the company to perform another phase III trial to prove it helps decrease the need hospitalizations and the incidence of severe RSV hypoxemia. ResVax has essentially demonstrated an ability to reduce these events, but one of the agencies might decide they need a whole new study that just focuses on those parameters. Of course, this would require more time, money, and patience from shareholders, which is something in very short supply. The company does have some cash in the bank to keep the company running at the moment. The company reported about $104M in cash, cash equivalents, marketable securities, and restricted cash at the end of 2018. On the other hand, the company burned about $45M in Q4, so we have to expect with the prospects of another Phase III the company will have to perform additional fundraising to keep the doors open. Another downside risk comes from competition, Novavax reports that AstraZeneca (AZN) and Merck (MRK) both have an RSV for infants. AstraZeneca is in Phase II for pre-term infants and has a breakthrough designation from the FDA. Merck is in Phase I for pre-term and full-term infants. Having competition from big pharma is a major concern and does diminish long-term prospects for ResVax in infants. The more immediate downside risk comes from the fact that the share price is under the NASDAQ listing compliance level of $1.00 per share. Which is why the company is asking investors to perform a 1-for-20 reverse/split. Unfortunately, a reverse split often becomes a binary event for the stock as traders use the low-float to move the share price up or down. If the company has not had any answers from the FDA at that point, I have anticipated the share price to be beaten down. Another risk is valuation with the market-cap above $200M and the company doesn’t have any products on the market. Although there still is upside potential in the company, we can’t expect bargain hunter investors to find its current valuation to be a deal. Yes, the upside potential is there but true bargain hunters need a better price to take a chance here. At first, the daily chart (Figure 4) does not look very appealing with the share price falling off a cliff and pancaking around $0.50 a share. However, the hourly chart (Figure 5) does show some signs of life as it starts to pull off the bottom with a few upward trend lines starting to form. Although it is a slow pace, we have to see this as a positive development and should look for a break above the top black line (~$ 0.65) on the hourly to signal a resurgence. On the other hand, if we see the share price break below the bottom green line ($0.52), we could see share price continue to deteriorate as new investors second-guess their position. The company believes the time of immunization should be focused on being administered between 26 to <33 weeks gestational age to enhance efficacy. Looking at the chart below (Figure 6), we can see that the mothers who were vaccinated <33 weeks had a greater vaccine efficacy through all endpoints. Perhaps this is the company’s key talking point when dealing with the regulatory agencies. If these agencies want to address RSV in infants and prevent hospitalization due to severe RSV hypoxemia, they might have to consider ResVax as possible option. I have waited for investors to lose hope and wave their white flags before entering NVAX. Now that most of the sellers are gone, I have entered the stock above the 52-week low. I first found hope in the charts but I have also discovered some hope in the potential of the RSV vaccine and a path to approval (Figure 7). The shareholder capitulation and despondency after the ResVax news has opened the door to a potentially high risk/reward opportunity and I am willing to take the risk. Looking at the charts, it appears the stock has shown signs of seller exhaustion and the upcoming conference could revitalize the stock in the coming days and weeks. However, I have to accept the substantial downside risks and binary events in the near future. The company has asked investors to vote for a reverse split in May and I will keep my position size to a speculative size until I see the market’s reaction to the R/S. Typically, I would use some call and put options in this situation but the R/S throws off the options market before and after, so I have to rely on the stock here. My ultimate plan is to hold my position through 2019 and will look to add to my position if the company receives a favorable ruling from the FDA and the EC. Disclosure: I am/we are long NVAX. I wrote this article myself, and it expresses my own opinions. I am not receiving compensation for it (other than from Seeking Alpha). I have no business relationship with any company whose stock is mentioned in this article.